A body found frozen in ice in the Boardman River has been found to be Constance “Connie” Snyder. Her body was found near the intersection of Island Lake Road and U.S. 131, an area that Rohn said was combed at least 10 times by search parties consisting of friends, dogs, helicopters, officers and an airplane. The police believe she died the day she went missing and a medical examiner will do an autopsy. 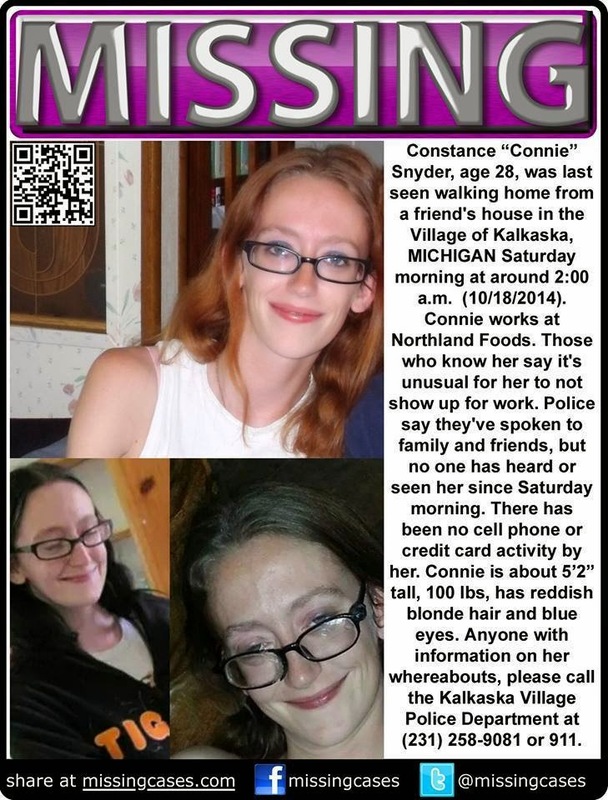 Connie Snyder, 28, is missing from Kalkaska, Mich. since Oct. 18, 2014. Connie works a Northland Foods and she has not shown up for work. Her last known whereabouts are in the village of Kalkaska and she was last heard from by her roommate at around 2 AM walking home from a friends house.